This book is a very difficult one to summarize, or even box into one genre, but I am going to try. My first instinct is to slot it as YA contemporary, but there is also some fantasy/ alternate reality, a little time-travel – so you see, it is a mixed bag of sorts. The plot revolves around Natalie, a girl of Native American origin, adopted into an all white family. She lives in a small town in Kentucky with her parents, and two younger siblings (who are biological kids of her adoptive parents), and the book is set in the summer after she graduates high school, and is all set to go to an ivy league college. So far it sounds like a typical coming of age story, right? Well, it’s not. Mostly because, ever since Natalie was a small girl, she had these ‘visitations’ in her bedroom at night from an old woman she decided to call – ‘Grandmother’, who told her Native American folktales, and urged her to internalize them. The people around Natalie feel that she is suffering from PTSD (post traumatic stress disorder), which makes her hallucinate, but Natalie is convinced that Grandmother is very real. Anyway, she goes to therapy, and stops seeing these ‘apparitions’ for many years, until one day when Grandmother appears again, and says – “Natalie – You’ve got three months to save him”. That’s it. She does not mention who is to be saved, from what, or even how. The only clue given is that Natalie will find her answers in the folktales that she has been told all her life. Soon after this warning, Natalie starts seeing a boy around her town whom she has never seen before, and to quote the blurb – she also starts seeing the ‘wrong things’ – her front door is red instead of its usual green, there’s a preschool where the garden store should be. That is when she realizes that something is terribly wrong. The story then follows Natalie as she tries to fix this puzzle – piece by complicated piece. This book starts very well – takes the readers right in the middle of the action. But after that, it is pretty slow paced, till about the halfway mark, where it becomes a page turner again. Now it is possible that I found it slow paced, because this book is more character driven than plot driven, and I am currently leaning towards the latter. It is also possible the first half is 50 pages too long. Also there are several themes that this book explores – friendship, first love, growing up and moving on, race perceptions, adoption, and also to a limited extent – feminism, abusive relationships, and cultural appropriation. In a way, there is something for everyone, which enables a wide variety of people to connect with something or the other. On the other hand, I felt that in the process of incorporating so many diverse themes, no one thing was given much importance, which makes it difficult for the reader to connect and/or be very invested in the story/characters. 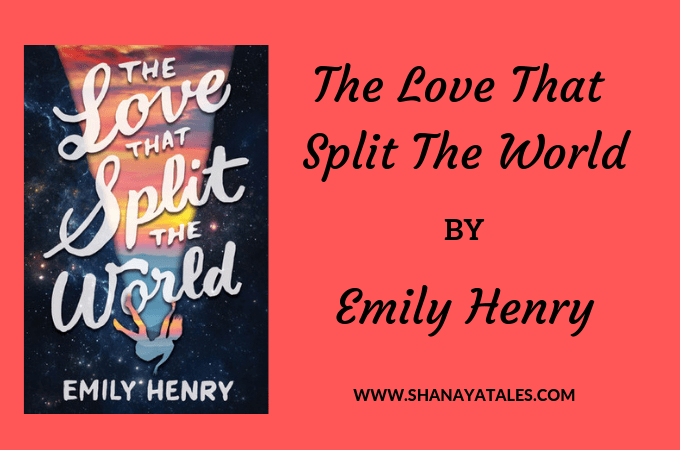 I am only mentioning this because the blurb compares this book to the The Time Traveler’s Wife (which if you have read my review, and book discussion, you know I loved) , and that book had one focus – time travel, and it evoked much stronger emotions than this one. But then again this is essentially a matter of taste. I know many people who love the presence of diverse themes in a book, and also many who enjoy exploring the different shades of single dominant theme as the story progresses. Also, there is a lot to love in this book. For a debut novel – the language is good, and the foreshadowing/ pacing (especially in the second half) is handled really well, and there is no denying that it is a very imaginative plot. This one comes dangerously close to Insta-Love, but since the love story is not the only theme here (yes, in spite of the title), I guess it’s okay, but insta-love is just very off-putting for me. I mean the title hints at an epic love story, not at a teenage insta-love. But don’t get me wrong, I did love the romance between Natalie and Beau, I just did not get their initial connection (possibly due to the above mentioned insta-love). The Ending! I really can’t say anything about the ending without spoiling something or the other, so let me just say that this is one of those endings that makes you go – Aww..how wonderful! (in a non sarcastic way). And then you think about it. I mean, really think about it, and you are like – Wait, what happened here? How did they go from Point A to Point B? And how does that even solve anything?! It is a well written, introspective story of amazing depth, but I personally did not like the ending (though I think that many might be okay with it); I just did not get how the current ending solves anything. If any of you got it, please enlighten me in the comments. Nonetheless, this was a good debut effort, and I will certainly be checking out the author’s future books. I loved the title! The title is what made me read the review, but when I read the summary, I realized I’ve been seeing this book up on my GR TL a lot – looks like it’s quite popular. With that said, I am not sure if I’ll read it. Not a big fan of time travel, (or insta-love) and I disliked Time Traveler’s Wife. On the other hand, big fan of magical realism – would recommend Salman Rushdie, Gabriel Garcia, and the most recent one I’ve read – Like Water for Chocolate by Laura Esquivel. Yes, the title and the blurb made me pick this one; and it is better than its peers in the YA segment, but the ending..sigh. Oh I want this one now. It sound really interesting. Is it a new release? Else I might find it in the library. It is a new release (released end of Jan 2016), but it is available in the libraries here; just has a long waiting list. So if it is available there, maybe you could put your name on the list. Very balanced review– wonderful job. Damyanti recently posted…Is #Writing #Fiction about Having Fun? Endings can be killer Shanaya. Recently I read one [without giving the name away] the lady is asked to abort by her hubby because she had a girl child. After a few blah blah blah.. she opened the door, he was standing with a sorry face and she goes home with him. Killer [sarcastic way :D] Lovely review. Thank you. Glad you liked it. 🙂 And yeah, endings can heavily influence our opinion of a book. I used to read time travel/sci-fi in my childhood. Not sure if I would like such YA fantasy book now. I dislike insta-love thing and also I get confused (and bored) if a book carries so many sub-plots or characters. You’ve reviewed this book wisely. Readers would get a clear idea if they want to read this book or not. I’d give it a miss. I had not heard about this book at all. But it sounds interesting to me with time travel and all that. I will add this book to my tbr. This one has a lot of positives, though consider yourself warned about the ending. It is not that it is a bad ending, and a lot of YA readers might love it; I guess I am just too analytical/skeptical for my own good. I have not had a chance to read this one yet, but I have been curious about it. I like the premise. I was sorry to see the ending didn’t work for you. That can really make or break a book sometimes. And I’m with you on insta-love. I am not a fan. Still, it sounds like this book does have quite a bit going for it even with its flaws. You have really become a very good book – reviewer, Shantala! Or, should I say, a pro? Loved reading about the book, but most of all the quotes. I could use all of those to describe certain phases in my life! I haven’t read this book or any other of this sort. But I liked the thing I read here..so I might grab it some time and read it to find out what happens in the end! The book sounds very interesting.. I saw this book covered by someone else too . Should try it out. As always, Shantala, you’ve given us another detailed, well thought out review. Looks like a mish-mash of a few genres, yeah? Yes, but this is more alternate reality than time travel. And at any rate, it is not the kind of time-travel done by Henry De-Tamble. That book (despite its faults) I loved! I will admit to being very eager to read this one but never getting a chance to do it yet. I loved the premise of the story but didn’t like the YA tag on it (not that I have a problem with YA but I wanted to read a similar story about adults). But after reading your review, I don’t know that it is for me. I may still read it if I come across it. Yeah, it is a decent read, though the ending did not sit well with me. But I have a feeling that it might work for the intended audience (young adults). I am probably a little too skeptical and analytical for my own good. Kala Ravi recently posted…#AToZChallenge 2016 Theme Reveal time! A mix bag of alternate reality, time travel and magic… sounds interesting and intriguing. The quotes from the book are so profound!